Lung cancer cells grown in a spongy 3D gel that mimics lung tissue. Photo credit Julien Yockell-Lelièvre and Roger TamResearchers in Ottawa and Toronto have created a spongy 3D gel that mimics lung tissue, allowing them to quickly screen hundreds of potential drugs for lung cancer and other diseases. The system is helping the researchers find drugs that not only slow cancer’s growth, but also prevent its ability to invade healthy tissues. This is crucial because cancer drugs that only target one of these pathways are more likely to fail. 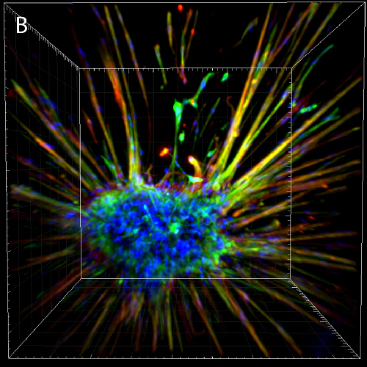 They tested the system on cells from patients at The Ottawa Hospital, showing that while lung cancer cells (shown at right) could readily invade and spread throughout the gel, normal lung cells did not. They have also screened over 800 potential drugs for activity against a disease called lymphangioleiomyomatosis (LAM), which is similar to lung cancer. This allowed them to discover several novel approaches to target this disease. Dr. William Stanford of The Ottawa Hospital and the University of Ottawa and Dr. Molly Shoichet of the University of Toronto are co-senior authors on the paper, which is published in Advanced Materials. Additional authors: Roger Y. Tam, Julien Yockell-Lelièvre, Laura J. Smith, Lisa M. Julian, Alexander E. G. Baker, Chandarong Choey, Mohamed S. Hasim, Jim Dimitroulakos. Funding: Research at The Ottawa Hospital is possible because of generous donations to The Ottawa Hospital Foundation. This study was also supported by the Canadian Institute of Health Research, the Natural Sciences and Engineering Research Council of Canada, the Canada Research Chair Program, the McEwen Centre for Regenerative Medicine, Green Eggs and LAM, the LAM Foundation, the United States Department of Defense, the Ontario Institute of Regenerative Medicine, the Canada Foundation for Innovation and the Ontario Research Fund.